WRC Illustration & Design Blog: lothlenan: Someone call a doctor, because doing this painting killed my hands. Good gravy. That foliage. HOWEVER. Finally, with some help and encouragement I managed to get through it. Special thanks to my fiance for their support and not letting me die in a deep, deep sea of despair :D Steven Universe ala “The Swing” in homage to one of my fave painters, Jean-Honoré Fragonard. lothlenan: Someone call a doctor, because doing this painting killed my hands. Good gravy. That foliage. HOWEVER. Finally, with some help and encouragement I managed to get through it. 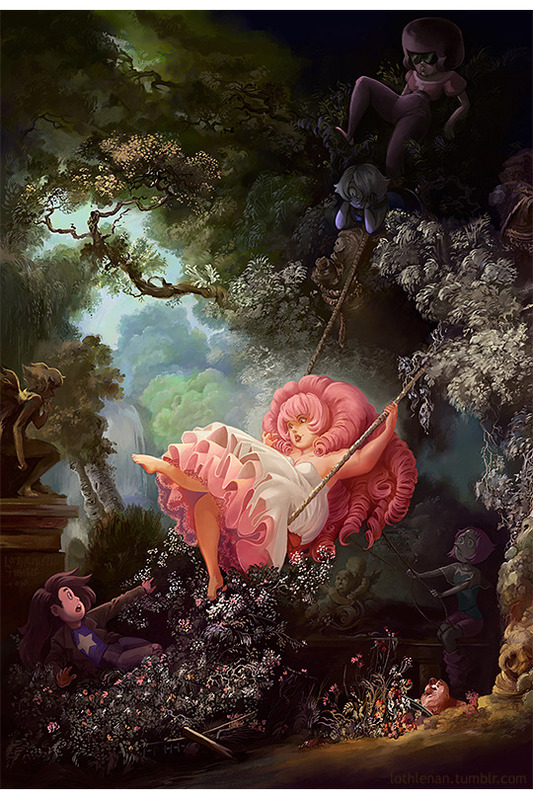 Special thanks to my fiance for their support and not letting me die in a deep, deep sea of despair :D Steven Universe ala “The Swing” in homage to one of my fave painters, Jean-Honoré Fragonard.